Kailash Mansarovar trekking tour in remote Himalayas through Nepal to Tibet is an ultimate pilgrimage and a life time spiritual adventure to experience at least once in a lifetime. 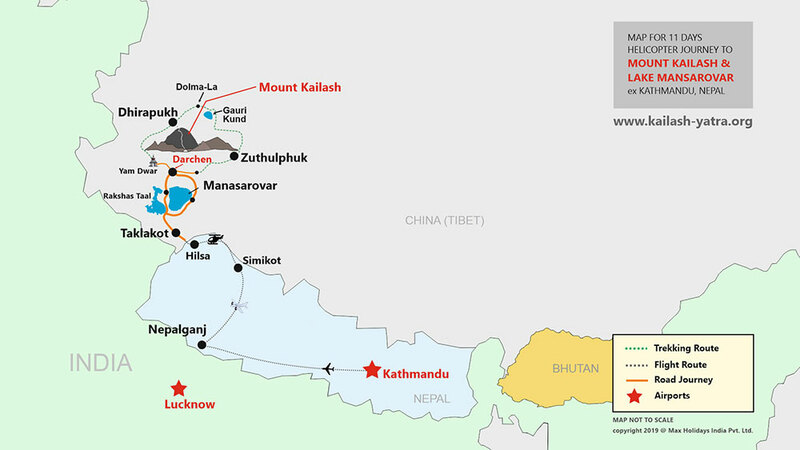 Kailash Mansarovar yatra by helicopter is an 11 days’ long trip starting from the capital city of Kathmandu in Nepal and taking the pilgrims to Burang region by fixed wings aircraft and helicopter from Nepalgunj via Simikot and Hilsa. The helicopter trip to Kailash Mansarovar is considered to be one of the quickest routes to visit this holy land. We offer 11 days’ helicopter tour to Kailash Mansarovar from Kathmandu, 09 days Kailash Mansarovar Heli yatra from Lucknow and Nepalgunj. For the VIP guests we also have the facilities for providing 03 to 06 days trips to holy Lake Mansarovar and Mt. Kailash, without Kora (Parikrama). 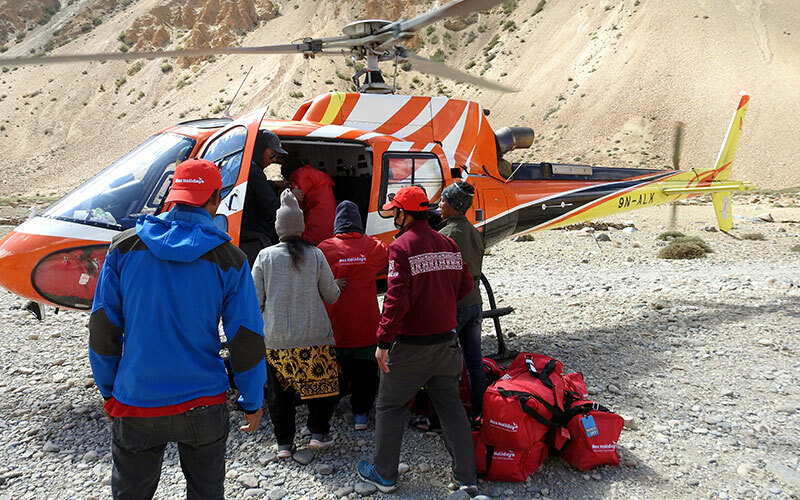 While Heli trips are the fastest ways to visit Kailash, it is to be considered that this route and all Kailash trekking trips by helicopter are completely dependent on weather conditions which change very frequently. In order to undertake a trip to Kailash Mansarovar and attempt / complete the 42 kms’ long Kora of holy mount Kailash, one needs to be fit both physically and mentally. A mind with faith in lord and a body with tolerance ability for tough climatic conditions can perform this challenging trip and bring back home sweet memories and beautiful images of the lord in their heart and eye. Embark on a lifetime spiritual adventure and trekking trip to Mount Kailash and Lake Mansarovar. Book your seat today in one of our fixed departure groups or ask our experts to design a private group travel for you. Upon your arrival at Kathmandu’s Tribhuvan International Airport, you will witness our tour representative expecting you there. After greeting you well, he will assist your transfer to the pre-booked accommodation in Kathmandu. Check into your hotel and then you are free to spend your day at leisure while acclimatizing your body with Kathmandu’s climatic conditions. Enjoy the delicious dinner, overnight stay in Kathmandu Hotel. Today morning, once done with the luscious breakfast, it’s the time for you to head towards the sightseeing tour of Kathmandu that includes the exploration of Pashupatinath Temple as well as the Budhanilkantha Temple (also recognized as Sleeping Vishnu). On the completion of this tour, you will be flying towards Nepalgunj through an hour flight from the domestic airport. Arrive at Nepalgunj, check into your pre booked hotel and then be a part of our briefing session along with your group mates. Dinner in the hotel. Overnight at Nepalgunj. Start your day with an assisted transfer to Nepalgunj’s airport from where you will board flight to reach Simikot. Note: The flights operating between Nepalgunj and Simikot totally depend on the prevalent weather conditions and thus, in case the weather bad continues your flight shall be delayed. However, if this is not the case then we will be flying towards Simikot in the morning. Stay overnight at your hotel/guesthouse in Simikot on sharing basis. Today you need to wake up early in the morning since we will checkout from hotel at around 06:30am for being ferried to Hilsa through a scenic helicopter ride. On reaching Hilsa, complete some immigration formalities and then enter in Tibet. Board a vehicle from there that will take you to your pre-booked accommodation at Taklakot. Stay overnight at your hotel in Taklakot. Enjoy some delectable breakfast and then spend your whole day at leisure for acclimatizing your body with the climatic conditions at Taklakot. 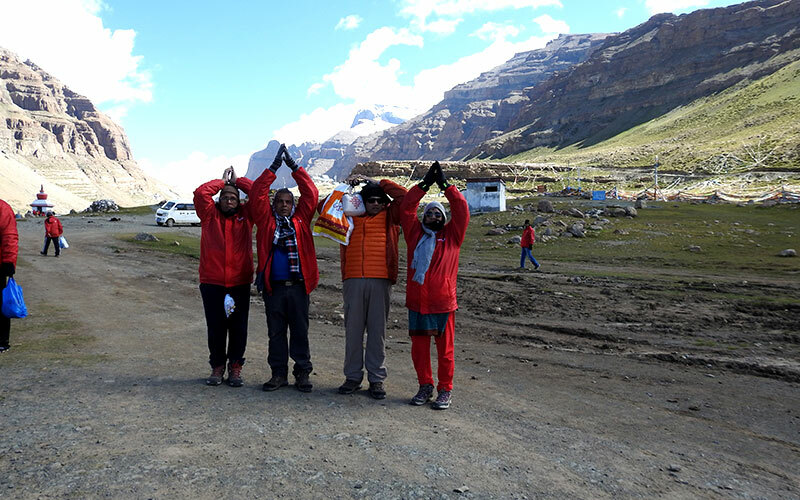 However, you can participate in some short treks organised by Max Holidays in the afternoon so that you can prepare for the Kailash trek starting from next day. Stay overnight at your hotel in Taklakot. Surely, this day is going to be the most memorable one since you will be having the first view or first Darshan of holy Mount Kailash and Manasarovar Lake. Firstly, have some tasty breakfast and then, start a two hours’ drive towards Lake Manasarovar from Taklakot. Arrive at Lake Manasarovar, check into hotel/lodge/guesthouse and then take some holy dips as well as perform the religious Puja accompanied with the Parikrama (circumambulation) of Lake Manasarovar. Once done, stay overnight at your accommodation located nearby Lake Manasarovar. Get ready to have the closest view of Holy Mount Kailash as you drive towards Yam Dwar today. Complete your breakfast and then arrive at Yam Dwar through a drive of 90 minutes. Yam Dwar is considered to be the commencement point of your Kora and from there you will start your 12 kms’ trek towards Dirapuk (4909m). The participants will be staying overnight at Dirapuk. Note: Those pilgrims who do not want to participate in this trek can go back to Darchen at their accommodation and wait for other group mates for two days there. Today’s trek is considered to be the most difficult one. One done with the tasty breakfast, start your trek towards Zuthulphuk. Firstly, you are going to trek up to an elevation of 19000ft and reach the highest point of this trek i.e. the Dolma La Pass and then, continue descending towards Gauri Kund. On reaching Gauri Kund, your trek would then become a flatter one as we trek along with the river to Zuthulphuk. On your arrival at Zuthulphuk, stay overnight at a lodge there. Today is the last day of our trekking. Have some breakfast and then, indulge in a short trek of about 2-3 hours. You will then be boarding a vehicle that shall drop you at Taklakot via Darchen and Manasarovar. Stay overnight at your accommodation in Taklakot. Start a scenic drive towards Hilsa once you have completed your breakfast. Reach Hilsa, complete some custom formalities there and then board a helicopter in order to arrive at Simikot from where you will get a flight towards Nepalgunj. From Nepalgunj, fly towards Kathmandu by taking a connecting flight from Nepalgunj. Stay overnight at your pre-booked hotel in Kathmandu. 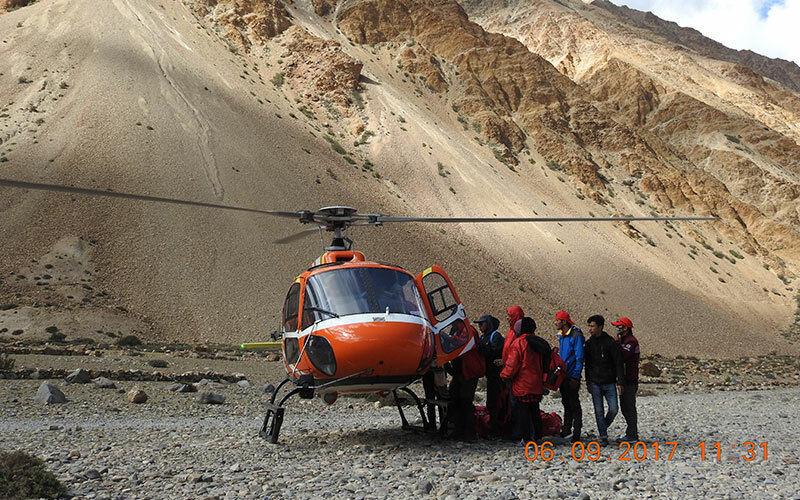 This day marks the end of your Kailash Manasarovar Helicopter Yatra. Enjoy breakfast and then get an assisted transfer to Kathmandu’s Airport for flying back home/onward destination. Air conditioned vehicle for airport transfer. On your Kailash Mansarovar trekking tour package from Kathmandu, you will be staying for 02 nights in a 3-4 star hotel in Kathmandu, 01 night in Nepalgunj, 01 night in Simikot basic guest houses, 03 nights Taklakot (Burang), 01 night Manasarovar, 01 night Dirapuk (trekking day 01) and 01 night Zuthulphuk (trekking day 02) in basic hotels / guest houses / tents. Remark : Our Kailash Mansarovar yatra tour packages are fixed departure group tours. For private groups arrangements please write to us. "I travelled with my mother to Kailash-mansarovar on 11days Heli-Kailash tour of ‘Max Holidays’ in July’18...I am happy the way Max team handled our entire journey... Specially Mr. Prince Bedi who extended his helping hand at every point during booking and then while traveling with us to Kailash. He calmly n patiently handled all our queries and was making sure to provide a safe n secure environment for women travellers like us (In our Grp we were 5 solo women traveller). The journey like this needs lots of preparation, manpower management n paperwork. Max holidays paperwork in terms of all required permits was perfect and we didn’t face any issues regarding same. Thank u ‘Max Team’ -Mr. Prince for making this journey successful for us." 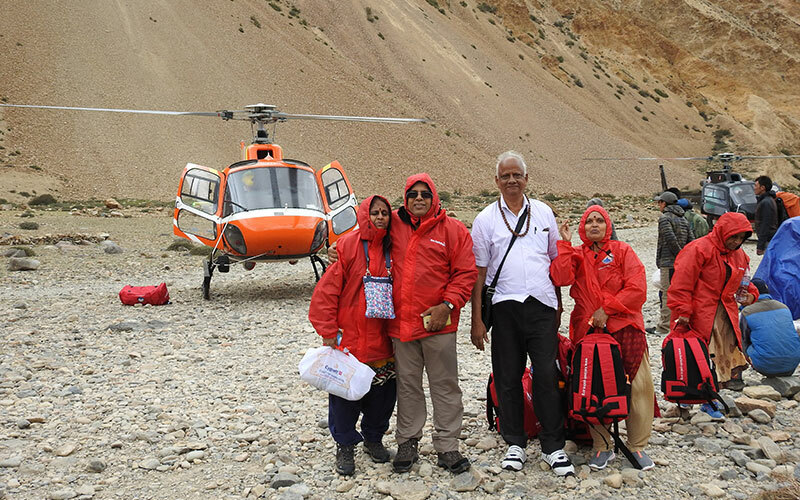 "I along with my husband and two sons participated in the Kailash Mansarovar Yatra’s Helicopter tour from Kathmandu. When I communicated with your team, I was highly impressed by the way they greeted us and also guided us about the whole tour and that was the time when I decided to seek their assistance for the holy Kailash Yatra. You guys worked really well and I surely enjoyed my days with you." "Few things command more respect than hard work, integrity, dedication and the ability to follow through. These are among the many attributes we experienced from start to finish after completing our trip to Kailash Mansarovar with this travel agent. This travel agent is an excellent listener and pays attention to every detail; a lost quality in today’s world. Although our itinerary took us to one off the beaten path village of locals, our agent managed to coordinate every aspect of our trip. The choice of guides were perfect for us. They were all skilled and reliable. The vehicles were always clean and stocked with water, and in some cases snacks for us to enjoy. Safety was never a concern. Our agent's recommendations for hotels and accommodations were spot on and extraordinary. I am a big believer in managing expectations and I must say that thanks to this agent, his years of experience and wonderful demeanour and disposition, our 12 days journey to Kailash Mansarovar was significantly exceeded all of our expectations. Selecting a travel agent and advisor can be frustrating and even dicey at times. Not in this case. We could not be more pleased with every component of our yatra and must give this agent, the tour company, the highest marks possible. Thank you!!!" "I decided to arrange a trip to kelash for them as the place is so beautiful for proper arrangement i needed contact an agency and after some good research i ended up searching max holidays. i've checked their website and found it to be up to the mark and just like their website the arrangement and facilities that were provided by them was very good. thnx max holidays"
"We 04 passengers me, my parents and my husband travelled together to Shiva’s home with Max Holidays and we had an amazing experience. I agree that there were many things not in their hand during this yatra such as …. flight operation, weather condition, accommodation in Similkot …... Hilsa and during trekking etc. but I appreciate the way they handled the situation….. As a traveller I have spent almost 170k per person and of course I want upto the mark services because in 170k I can explore the whole Europe with all good facilities. But this is not a leisure trip … this is a pilgrimage to the homeland of Lord Shiva and who said to meet SHIVA is easy …… at the end …. Great job done by the team of Max holidays.."
I write this note as a token of appreciation for the way you handled Guruji's (Mr. Bhopal) trip to kailash Mansarovar. Our interactions in your office were not only comforting but made us feel confident that Guruji would be well looked after. Your suggestions n attention to the minute details in his travel itenary were a source of great encouragement to his followers as Guruji was traveling alone. Please accept our heartfelt thanks for making this trip so memorable. Wish you all the very best in life from all of us." "We, a group of three people undertook the sacred the pilgrimage to Kailash Mansarovar on 6th of May. We were a little tentative to begin with since we had a terrible experience within a travel agent the year before.Our Yatra was via Nepalgunj-Hilsa-Taklakot route and we had a helicopter ride from Simikot to Hilsa. At the outset I must say it is extremely difficult to provide any kind of service in the terrain and the atmosphere that one tackles there not to mention that one has to travel across three countries which makes it not just tedious but cumbersome as well. Add to that the weather can be inclement and can disturb even the best logistical planning that one may have done." "Hi Vidushi, Minakshi, Amit. Thank you for all your help in successful completion of Kailash yatra, it was a crucial journey and not a easy one , really appreciate your efforts!!!"